Everyone loves a great view from their hotel room. In fact, our guests’ most frequent type of request is for a guestroom with a view. A lot of guests who stay with us again and again already know which views they favor. However, for those who haven’t been to our hotel it might be a bit more difficult to know which guestroom and view is best for them. (They’re all great, by the way. Some just offer different perks than others.) The easiest request is to ask for a high floor with a pool view, but there are more choices at our hotel. 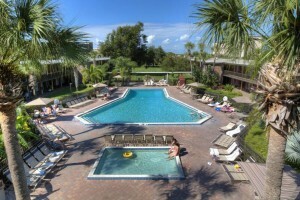 Rosen Inn International has two swimming pools surrounded by guestrooms offering great views. If you want a quieter, more tranquil view, we also have guestrooms overlooking the courtyard fountain and central lawn. Like I said earlier, all of our guestrooms are great. Our grounds are rich with lush greenery, which you can enjoy from any guestroom. Beautiful trees and flowers bring life to our hotel and provide a calm and welcoming change of scenery from theme parks and the hustle on International Drive. If you have an idea of what type of view you’d like, plan ahead and send us your preferences. Our staff is happy to take them into consideration when assigning guestrooms.